Download the registration form to be a part of the drawing program. Art Exhibit from Wee Pal's creator at EOYDC. 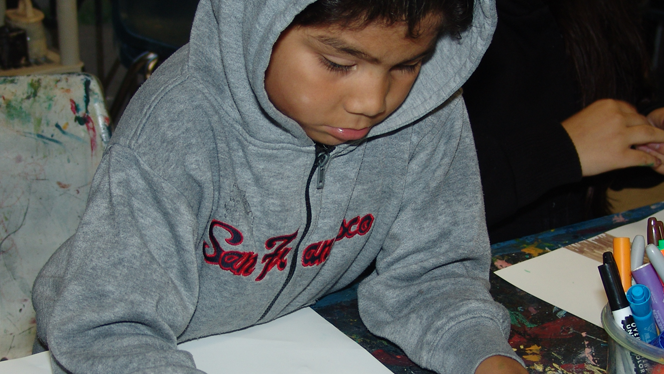 Your donation can help provide art supplies and art appreciation experiences to our youth. Participants are encouraged to express themselves using art as their vehicle. Every participant is given is given tools to help them develop and succeed. The curriculum is designed to provide youth with an educational background into the art making process. Along the way they learn discipline, teamwork, and task completion. This class teaches the importance of learning different mediums, such as, watercolor, color pencil drawing, large scale painting, mixed media, and various other mediums. The instructor, Joanne Ludwig has been teaching this class for three years. Ms. Ludwig is very active in the artistic community as an exhibitor, curator, and community art activist. Tuesdays and Thursday 3:30 -6:00pm.